Steps from the casinos and nightclubs, gather in the serenity and prestige of the city's most acclaimed hotel an exclusive, intimate, non-gaming environment with imaginative chefs, sparkling facilities and impeccable, intuitive service to make your wedding magical. The Palm Room and Palm Lounge are just off the lobby. The Palm Room features nearly floor-to-ceiling windows overlooking the landscaped porte cochere. The room provides a built-in bar with adjacent private kitchen. This Palm Room reflects the Hotel's elegant residential ambience, with arched ceilings, stately pillars and select art work. Fine wood panels divide the honey-toned Palm Room and Palm Lounge for more intimate gatherings. The Hotel's newest spaces for meetings and events, the Palm Room and Palm Lounge reflect an elegant residential ambience. The Palm Lounge features arched ceilings, stately pillars and select art work. Fine wood panels divide the honey-toned rooms for more intimate gatherings. The fine quality traditionally found in a grand residence is evident in the richly textured carpets, elegant wainscotting accents and fine, honey-toned wall coverings. With such exquisite surroundings, your function is sure to be a success. An elegant space for pre-function gatherings, The Four Seasons Ballroom Foyer offers a rich, honey-toned ambiance. The Acacia Ballroom emanates opulence. The ballroom also offers state-of-the-art staging and audiovisual capabilities, automobile access, a built-in projection screen and an adjoining pre-function room. Its natural shades of green, gold and warm woods, arched doorways, wainscotting accents and unique chandeliers create a residential atmosphere conducive to any event. This pre-function gathering space matches the Acacia Ballroom in opulence. Its natural shades of green, gold and warm woods, arched doorways, wainscotting accents and unique chandeliers create a residential atmosphere conducive to any event. This moderately sized room provides ample space for intimate gatherings. The adjacent pre-function space is ideal for private coffee breaks and service. With its rich bronze and warm honey tones, the Cottonwood is ideal for any occasion. The Desert Willow is an ideal meeting room for functions accommodating 40-80 guests. Bronze and honey tones lend a warmth to private meetings. The Mesquite Room offers versatility with its connecting rooms and the attached outdoor balcony. This residential style meeting room offers windows with plantation shutters looking over the gardens by the pool. An elegant space in warm honey tones. The Mesquite Room offers versatility with its connecting rooms and the attached outdoor balcony. This residential style meeting room offers windows with plantation shutters looking over the gardens by the pool. This room features abundant windows and lush tones of green and warm honey. The moderately sized Palo Verde provides ample space for intimate gatherings. Adjacent pre-function space is ideal for private coffee breaks and service. Rich bronze and warm honey tones make the Palo Verde ideal for any occasion. This moderately sized room is ideal for small meetings and meal functions of up to 10 people. This room may also be used as an office or registration area. This room features a window and lush green and warm honey decor. Offering a 180-degree wraparound view of Las Vegas Valley and Mountain, the Executive Business Suites are located on higher floors. Muted earth tones make the Executive Business Suites ideal for any occasion. The poolside terrace offers a creative outdoor function space for evenings. Lit with tiki torches, it becomes an elegant setting for receptions and cocktail parties. Or, create a tropically themed pool party or birthday celebration. This lushly landscaped area provides a tropical ambiance. The Fountain Terrace provides a fun and versatile outdoor meeting space in the heart of Las Vegas. Set within the Hotel's lovely pool gardens. A tropical setting, with lush landscaping, tiki torches and refreshing waterfalls. At Four Seasons Hotel Las Vegas, we recognise that your wedding day is one of the most important days of your life. One of our experienced Catering Managers can provide information about holding your wedding at the Hotel, and will be available to assist you in the details of your special day. From reserving your date to planning your menu and making your beverage selections, our Catering Manager will help you create a memorable event for you, your family and your guests. For more intimate weddings, guests may choose to have their ceremony and/or reception in one of our elegant suites: the Presidential Suite, on the Hotel's top floors with dramatic views; the 180 Degree Strip View Suite for thrilling panoramas of the Las Vegas Strip, the Sunrise/Sunset Suite, set against the natural landscape; and the Las Vegas Strip View Suite for a glittering Las Vegas affair. The all-marble Grand Staircase features a beautiful railing and a large floral centrepiece which, if you are using the Hotel's in-house florist, can be made to match your wedding flowers. Holiday time is particularly magical with its decorations around and on the staircase. The Lobby fireplace area with its elegant residential furnishings creates an intimate photo setting. 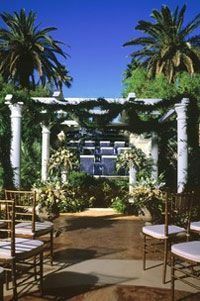 The lush outdoor gardens and fountains at Four Seasons Las Vegas offer a storybook background for a wedding photograph. Four Seasons can help you coordinate the paperwork required to hold your ceremony here. Please contact our Wedding Specialist for details. Four Seasons will be pleased to assist you or to make arrangements with our preferred floral designers, or the florist of your choice. We can also create themes and matching dcor for your event setting. Our talented in-house French Pastry Chef will create a customised wedding cake in the flavour of your preference. If you have a photo of a special cake, we will be happy to prepare that cake for you. If you choose to do so, you may provide your own wedding cake. Please note: a cake-cutting fee will apply. The Hotel offers an extensive variety of banquet menus. Our culinary staff has created a selection of choices to accommodate a wide variety of tastes. Menu pricing is based on a three-course luncheon and a four-course dinner. However, we would be pleased to custom-design a menu to suit your specific needs. A full set of menus or a customised proposal can be obtained through our catering office. Catering to You brings the food, service and ambience of Four Seasons to any location you select. We excel in pleasing individual tastes with customised menus prepared at the location site, if possible. Elegant table settings are provided, with every element thoughtfully chosen. Rely on the impeccable, unobtrusive service for which Four Seasons is renowned. A separate kosher kitchen makes Four Seasons Hotel Las Vegas a particularly welcoming venue for the Jewish community. To oversee the preparation of all food, a specially qualified supervisor of kosher laws is on hand for each event. In keeping with the Four Seasons reputation, the kosher menu adds delicious imagination to traditional specialties. For further details, please contact our Catering Manager. We would be happy to provide a list of entertainment services to enhance your wedding celebrations, including harpists, pianists, chamber music, DJ and bands. At your request, we can provide a list of recommended vendors for all your wedding needs, including photographers, videographers, tuxedo rental and party favours. Four Seasons defines the essence of a superb honeymoon. As a destination setting, for just you two or for your whole party, we make weddings and honeymoons seamless and inspiring. For your first night, we offer a retreat of peace and comfort - with a smooth start for your trip to another Four Seasons honeymoon setting. Or, for your honeymoon with us, we can help you craft every unforgettable detail. ADDRESS 3960 Las Vegas Blvd. S.